This is a mixed media pin I did a while back for a book that didn't materialize. I really love this design. It’s got an art deco flavor and a modern appeal. I used Ranger paint dabbers in red pepper, jet and lettuce on inexpensive wooden discs I purchased at the craft store. I stamped them with Ranger dabbers in silver, snow cap and jet to create texture and interest. The pewter twig is from Ornamentea. I used Beacon 3-in-1 glue to adhere the discs and attach a pin back. It’s all sealed with a layer of Judikins Diamond Glaze. 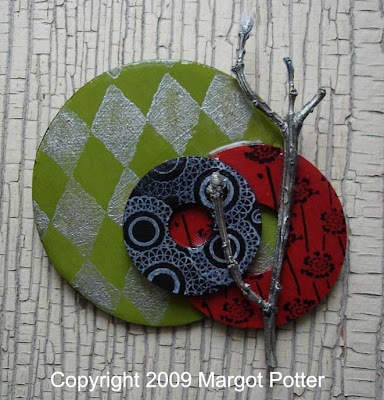 It’s fairly easy to turn inexpensive materials into striking jewelry components. Wander the aisles of the craft stores, scrapbook stores and your local hardware stores...heck even poke around in your recycling bins. You’ll soon realize there is an endless array of cool stuff you can trick out for a small amount of pocket change. Ten points to those of you who understood yesterday’s post. It’s from Winnie the Pooh. I didn’t suddenly forget how to spell! Until next time...craft on with your bad selves. This piece makes me think of how we need to maintain balance between nature and the city. Sort of post-modern. Seriously!!! I made one of my favorite necklaces with a washer from the hardware store, glue and a glass pebble. The points are worthless, beyond making you feel good for knowing! Thanks for the compliments...I agree...great design is often far more than the sum of its parts. Most awesome! Expect some linkage from Scary CRAFT!